In many ways Jonathan Evison’s West of Here was one of the most unexpected literary bestsellers of recent years. It didn’t feature a dysfunctional family, vampires, werewolves, or fifty shades of anything. There wasn’t a romance, or a crime, or a political message at its core. It wasn’t even set on the East Coast. Instead Evison gave us a multi-faceted fictional history of the Pacific Northwest that had more in common with John Steinbeck or Jack London than any of his peers, a book so broad in its scope – and yet so narrow in its regional appeal – that it’s remarkable that it spoke to as many people as it did. By Evison’s own admission he often overreached, and the fragmentary narrative sometimes hung by the thinnest of threads. What pulled us through in the end was the undeniable force of Evison’s own character, which imbued every page. 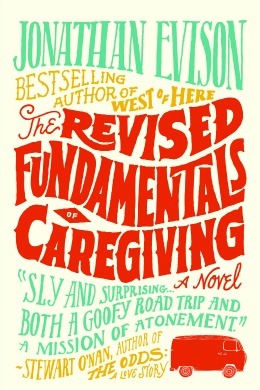 The Revised Fundamentals of Caregiving, Evison’s third book, could be seen as a direct reaction to the challenges of his previous novel. While West of Here was long and rambling, this one is short and focused; while one shot for the moon, the other has its feet firmly planted on the ground. Gone are the multiple points of view, and the sweeping historical canvas. Instead, Revised Fundamentals zooms in on one character, Benjamin Benjamin, a recently qualified caregiver whose first paid job pairs him with Trev, a teenage boy whose muscular dystrophy doesn’t keep him from being as moody, horny, and generally inappropriate as any teenager. Benjamin has a tragedy in his past too, but he won’t tell us “what happened to my daughter or my son or why my wife left me or how I lost my house.” Instead Evison keeps these specifics in his back pocket until the last minute – one of the novel’s few obvious writerly devices – but we can easily imagine Benjamin’s pain without needing specifics. When Benjamin and Trev head out on an ill-advised road trip to visit Trev’s “distinctly clownish” father in Utah you just know there’s catharsis over the horizon for both of them. If this makes Revised Fundamentals sound simplistic and straightforward, that’s because it is. Unlike many of his peers Evison seems to consciously avoid any literary fireworks, preferring a simple prose style and a familiar, linear narrative. This is a novel that tastes so vanilla at first that you can’t help craving the complexities of West of Here, whether they’re fully realized or not. Evison has stated that Benjamin’s voice is remarkably close to his own, and it’s all too easy to interpret this first-person narrative as a lazy option, the quick route to getting a third novel on bookstore shelves. After the literary complexity he’s displayed before, this feels like Evison writing on autopilot. To write the book off so early, however, would be a mistake. While it’s true that the narrative voice is almost identical to the author’s, and the plot moves somewhat predictably towards its slightly obvious conclusion, it slowly becomes clear that Evison is aiming for a different kind of complexity here. Where West of Here was all about structure and technical achievement, Revised Fundamentals aims for emotional resonance and depth. The deceptively simple first half quietly works its way under your skin, and although it does so without fireworks it gradually fleshes out the suffering and sacrifice of its central characters. When we finally reach the narrative’s emotional crux we’re surprised to discover just how deeply we care. Evison’s cast is largely made up of outcasts and the walking wounded – Benjamin’s statement that “None of my zippers work anymore, which must be some kind of metaphor” could apply to any of them – but there’s no ironic distance here. Despite their many flaws we care for them almost as much as they care for each other. Suddenly that title makes a whole lot of sense. As with all of Evison’s work, a large part of its appeal also lies in his bawdy wit, and it’s used to good effect here, humanizing characters that might all too easily have turned into Oprah-friendly stereotypes. Trev is far from the tortured victim you might imagine, and the extended dialogue he has with Benjamin about sordid nicknames for sexual acts like the “German Knuckle Cake” or the “Disappearing Panda” becomes the book’s longest-running gag. Even as he’s exploring Benjamin Benjamin’s guilt and pain, Evison keeps the tone buoyed with a dirty humor and a dry wit that might soon be registered as his trademarks. It’s a tough balancing act to pull off – juggling the painful and the profane – but he manages to hit the right note every time, using the humor to draw us into Benjamin’s inner circle before sucker-punching us with his emotional scars. It may not be as flashy or as marketable as West of Here‘s grand sweep, but it shows a literary dexterity that’s just as awe-inspiring. With his last two novels Jonathan Evison has tackled two very different challenges – the logistics of multiple voices in an epic narrative, and the finer nuances of the first person confessional novel – with a casual disregard for modern trends and conventional career progression. It’s as if he’s determined to set himself a different challenge every time he puts pen to paper, and while he doesn’t always hit the bullseye at the first attempt, you have to admire his ambition. Just like its predecessor, The Revised Fundamentals of Caregiving isn’t perfectly executed – but it does carry an emotional wallop that sneaks up on you unawares. And that’s a trick that even the finest novelists sometimes fail to master.